Simon & Schuster, 9780684824901, 944pp. 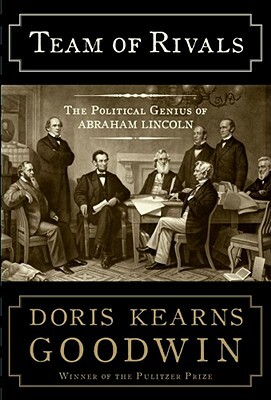 Acclaimed historian Doris Kearns Goodwin illuminates Lincoln's political genius in this highly original work, as the one-term congressman and prairie lawyer rises from obscurity to prevail over three gifted rivals of national reputation to become president. On May 18, 1860, William H. Seward, Salmon P. Chase, Edward Bates, and Abraham Lincoln waited in their hometowns for the results from the Republican National Convention in Chicago. When Lincoln emerged as the victor, his rivals were dismayed and angry. Throughout the turbulent 1850s, each had energetically sought the presidency as the conflict over slavery was leading inexorably to secession and civil war. That Lincoln succeeded, Goodwin demonstrates, was the result of a character that had been forged by experiences that raised him above his more privileged and accomplished rivals. He won because he possessed an extraordinary ability to put himself in the place of other men, to experience what they were feeling, to understand their motives and desires. It was this capacity that enabled Lincoln as president to bring his disgruntled opponents together, create the most unusual cabinet in history, and marshal their talents to the task of preserving the Union and winning the war. We view the long, horrifying struggle from the vantage of the White House as Lincoln copes with incompetent generals, hostile congressmen, and his raucous cabinet. He overcomes these obstacles by winning the respect of his former competitors, and in the case of Seward, finds a loyal and crucial friend to see him through. This brilliant multiple biography is centered on Lincoln's mastery of men and how it shaped the most significant presidency in the nation's history. Doris Kearns Goodwin’s interest in leadership began more than half a century ago as a professor at Harvard. Her experiences working for Lyndon B. Johnson in the White House and later assisting him on his memoirs led to her bestselling Lyndon Johnson and the American Dream. She followed up with the Pulitzer Prize–winning No Ordinary Time: Franklin & Eleanor Roosevelt: The Home Front in World War II. She earned the Lincoln Prize for the runaway bestseller Team of Rivals, the basis for Steven Spielberg’s Academy Award–winning film Lincoln, and the Carnegie Medal for The Bully Pulpit, the New York Times bestselling chronicle of the friendship between Theodore Roosevelt and William Howard Taft. She lives in Concord, Massachusetts. Visit her at DorisKearnsGoodwin.com or @DorisKGoodwin.